In large bowl, break up cookie dough. Mix in 1 cup of the peanuts. Cover; refrigerate about 30 minutes or until well chilled. Heat oven to 375°F. Spray cookie sheets with CRISCO® Original No-Stick Cooking Spray, or line with cooking parchment paper. Shape dough into 36 (1 1/4-inch) balls. Place balls 2 inches apart on cookie sheets. Flatten to 1/2-inch thickness with lightly floured metal spatula or drinking glass. Bake 9 to 11 minutes or until edges are golden brown. Cool 5 minutes; remove from cookie sheets to cooling rack. Cool completely, about 30 minutes. Meanwhile, in 2-quart saucepan, melt butter and peanut butter over medium heat, stirring occasionally. Remove from heat; stir in vanilla. Cool 1 minute. Stir in powdered sugar. When cool enough to handle, knead filling several times until powdered sugar is thoroughly blended. Shape into log, about 9 inches long and 2 inches in diameter. Cut into 18 (1/2-inch) slices, reshaping slices into round shape if necessary. Cover with plastic wrap; set aside. 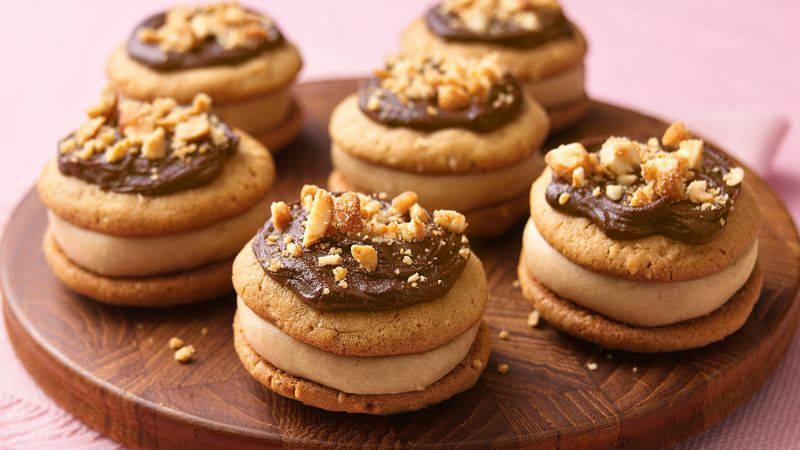 When ready to assemble cookies, place 1 filling slice on bottom of 1 cookie; top with another cookie, bottom side down, and press together slightly. Repeat with remaining cookies. In medium microwavable bowl, microwave chocolate chips and whipping cream uncovered on High about 1 minute, stirring twice, until melted. Spoon heaping 1 teaspoonful on top of each cookie. Sprinkle with remaining ground peanuts. Let stand 10 minutes or until ganache is set. Store tightly covered in single layer at room temperature. *To grind peanuts, place in food processor bowl with metal blade. Cover; process with on-and-off pulses until coarsely ground.